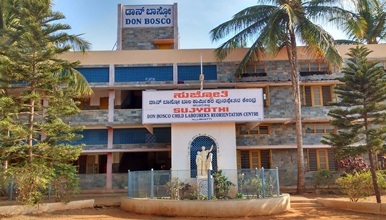 Don Bosco Davangere is involved in the education and rehabilitation of child labourers and marginalized youth and also provides pastoral services to the catholic community in the neighborhood. In 1996, work for the children was started at Davangere foreseeing the child labour problem around the city. 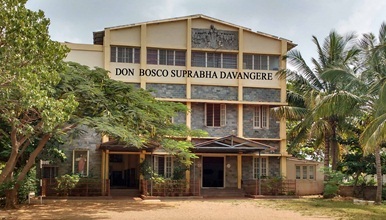 Don Bosco Davangere began in 1996 with a non-formal school for the school dropouts. A special school for child labourers was initiated in 1998 through the motivation of Government of Karnataka with the help of Women and child welfare department. Hence Don Bosco Rehabilitation centre for the child labourers began in the city. Don Bosco Sujyothi is situated in Alurahatti village about 14 km from Davangere city. It was inaugurated in the year 2002. The main objective of this centre is to conduct re-orientation programmes for child labourers who were rescued from Davangere districts. This centre is exclusively for boys. The school dropout boys are given Residential Bridge Course in order for them to join the main stream school. Few boys from vulnerable backgrounds are made to stay to pursue their education (school going). They are taught time management, discipline and how to be good citizens for the present society.